The November 2014 Transition Network newsletter Is this email not displaying correctly? The website theme ‘Rethinking Real Estate’ asks « is it beyond our creativity to provide our fellow human beings with shelter and sustenance without covering more of the world in concrete?”. In ‘Thinking Aloud’ we reflect on how much gender is an issue in Transition and some thoughts on the impact of words that we use. In ‘On the road’ there are reports from Transition events in Scotland, France, Germany and Italy. REconomy considers the resourcing needed to initiate change and Transition Free Press looks at how cultural values are shaped. Plus there are several articles on ‘Inner Transition’ from Japan, Denmark and Naoimi Klein as well as new training and films. Our approach to an economic crisis caused by an unsustainable housing bubble is increasingly to create another housing bubble. What could possibly go wrong? This month we explore what a different approach could look like. It began with an editorial piece that introduced a new term, SWIMBY – as in « Something Wonderful In My Back Yard ». Topics covered include housing bubbles, an urban mushroom farm and agriculture, engaging with the the planning/development process, plus what good consultation looks like. The women of the Transition Network staff and board have been meeting every 2-3 months in Totnes. Fiona Ward & Sarah McAdam share some of the useful things that have emerged so far. On reading a lamentable piece of climate activist-bashing in the ‘Mail on Sunday’ it was not the “someone will have to be held accountable for us committing economic suicide” bit, awesomely stupid and sodden with irony though it is, that had Rob Hopkins reaching for the Rant Button. The first Transition Roadshow proper is a bit unique as it was hosted by a Transition Initiative based in a University. Surviving an umpa-umpa sing-along session on the train, Ben Brangwyn reports on his trip to the German speaking Transition conference. The French edition of The Power of Just Doing Stuff has recently been published and Rob Hopkins went over to help launch the book and give the initiatives there a boost. Italy, as everyone reminded Rob Hopkins everywhere he went on a trip to Bologna, « is very complicated ». Transition: Live and Unleashed in the New Forest! The New Forest, the Live and Unleashed! exhibition runs until Sunday 23rd November in Lyndhurst. Rob Hopkins reports on his visit. We are keen to learn more about how Transition Initiatives are finding funding to pay people to co-ordinate their core work. Can you help and share your experience? What’s REconomy about? How are we talking about it today? Here’s a pithy summary presented at the recent St. Andrews REconomy workshop, by Sarah McAdam. When you talk about Inner Transition with people from other places than your own, you hear very different stories and ideas. Sophy Banks shares some of what she heard when a group of Transitioners met in Copenhagen. Despite the distances involved to get there Debbie Warrener felt a call particularly strongly after the ‘3.11’ triple disasters of the tsunami, earthquake and ongoing nuclear disaster to offer Joanna Macy inspired workshops throughout Japan – in Japanese. Getting comfortable with our own inherent goodness is a tremendous challenge for many writes Pamela Boyce Simms. And as we’ve witnessed time and time again, in movement after movement, legislation is utterly impotent at the level of embedded human beliefs and identity formation. There is no legal shortcut. There can be no enduring outer transition without a corresponding inner-transition. How key is one activist in a Transition Initiative? 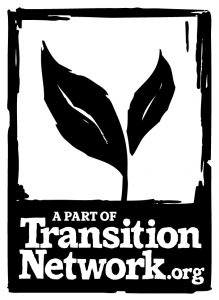 London hosts two trainings in December- Inner Transition and Transition Launch, and the all new Permaculture For Transition Course in January. Our next, new format, Launch OnLine begins Tuesday January 13th at the new time of 09:00 GMT. This film looks at the market town of Totnes and some of the food and finance projects taking place there. It also compares this to Bristol and some of the projects there that are reaching scale. School Farm, Grocycle, Totnes Pound, REconomy, Bristol Pound, Bristol Energy Co-operative are amongst the projects outlined. Some 20 screenings on the weekend of November 14-16 and feature a wide range of ground-breaking initiatives. The programme includes hands-on Workshops with local film-makers, children’s matinees and discussions with directors.